The Devonshire Dome is one of Buxton’s most iconic buildings. The vast space is the biggest unsupported dome in Europe and was built in 1779 by the fifth Duke of Devonshire. Its original purpose was as a grand stable block and later it was converted into a hospital. It is now part of the University of Derby, housing the Buxton Campus. The students here study culinary arts, as well as event, hospitality and spa management. The Dome remains open to the public as a multi-purpose catering site, including a café, fine dining restaurant, and a banqueting facility for up to 1,000 covers. Plus there are two student dining outlets and the site also caters for lecturers and senior management. Much of the catering operation is staffed by students. Recently The Dome made major changes to its catering operation, building a new kitchen and refurbishing an older one. Both new facilities are designed around prime cooking appliances from Falcon. The kitchens at The Dome feature a wide selection of Falcon appliances, including oven ranges, a chargrill, induction hob, twin pan fryer, gas grill and a gas boiling table. Falcon also supplied four Lainox Naboo combination ovens – two 40-grid and two 7-grid models, along with dedicated banqueting trolleys. The breadth of Falcon’s range, plus its performance and quality of build were clear attractions – as was its popularity in the market. “Another reason we have Falcon equipment is that it is likely that the students will come across the brand in a food operation,” says Richard. Richard has also been impressed with the combi ovens. “The flexibility you get with the Naboo is excellent. 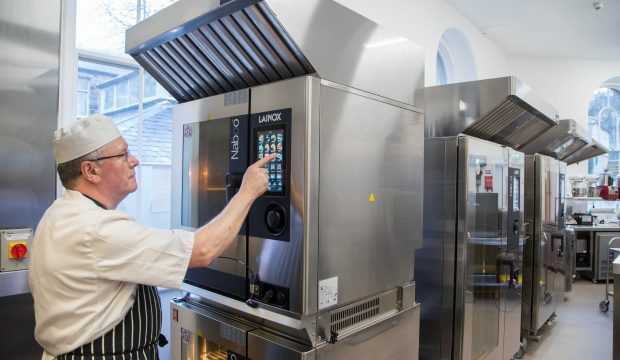 Students can develop a menu on their laptop, upload it to the Lainox Cloud and see this menu appear on the combis in the training kitchen, where they can then test the recipes and tweak them where required. It’s also great that the ovens can store an unlimited number of recipes. We’ve got around 2000 already for the students or indeed my team to work with! “The Naboo’s Cloud connectivity is the future – it allows you to access and download all sorts of information, tips and recipes. All of the refrigeration in the new kitchen is from Falcon’s sister company, Williams.